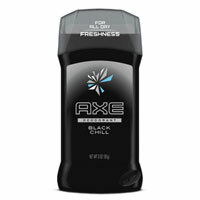 Axe soap, shower gel, lotion and fragrance list. Body wash made for men. Axe bath and body collection: AXE, a leader in men's care, is an iconic personal care brand around the world that helps guys look, smell and feel their best. The Unilever-manufactured brand is available in a line of deodorant body sprays, deodorant and anti-perspirant sticks, shower gels and hair care products. AXE is the No. 1 men's grooming brand in the U.S., excluding shaving hardware, and achieved this status only seven years after launch. 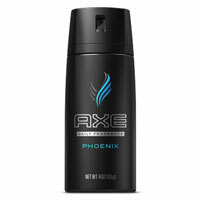 Including deodorant body sprays, AXE is the largest men's deodorant brand in the U.S. The brand's mission is to help give guys confidence with grooming products that reflect individual personality and lifestyle.